The band headed to Los Angeles to make some recordings with Barry De Vorzon at Valiant Records. Music critic, Richard Skelly (Richmond Review, Radio West.ca, RPM Magazine), reveals that the “band didn’t have an actual name when they demoed a few songs for New Syndrome, a production firm owned by singer Tom Northcott and entrepreneur Jack Herschorn. An American ex-pat, Herschorn pitched the demo tape to assorted Los Angeles labels. Valiant bit…and brought the band down for some initial sessions. At the time, the boys were honing their style by playing behind amateur strippers at the Torch Cabaret. … patrons simply called them “The Torch Band.” After recording “Looking At A Baby,” Valiant (probably De Vorzon himself) gave them two options for a name: The Connection or The Collectors. 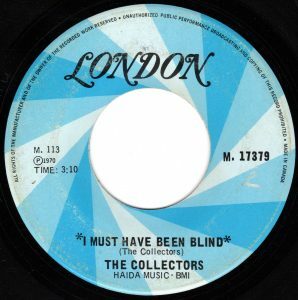 Not so coincidentally, Valiant’s other up-and-coming band was called The Association.” Howie Vickers recalls “We couldn’t agree ‘collectively’ on a name…They were about to press the record and (so) The Collectors it was.” Out of the recording sessions with Valiant Records, The Collectors had two singles that made the Top 40 in Vancouver in 1967. The first released early in the year was Looking at a Baby”, followed in August ’67 with “Fisherwoman”. In 1968 The Collectors had another Top Ten hit in Vancouver with “Lydia Purple”. Several more hits followed at the end of the decade including “Early Morning” in 1969, and “I Must Have Been Blind” in 1970. “I Must Have Been Blind” is a song about a guy who gets his education in a three room school. He moves to the city without reflecting on what county living offers him. Once he gets to the city he discovers faceless people who are all caught up in a rat race where the odds are stacked against them. He goes back to the country to find his three room school. But, he discovers it’s been demolished. He finds that life has become twisted and longs for peace of mind. Finally, he finds a three-room school elsewhere with children to attend and he gets letters from a friend who observes going to the city was a bad choice. Now that the narrator of the song returns to the country, he has a place and life is good. “I Must Have Been Blind” was one of a number of songs on the radio in the late 60’s and early 70’s that viewed urban life with alarm and idealized living in the country. Joni Mitchell sang about a “Big Yellow Taxi.” Vancouver’s Spring told about “A Country Boy Named Willie” who had no need for the city. The Kinks sang about poverty in “Dead End Street” and Lighthouse advised “Take It Slow (Out In The Country)“. “I Must Have Been Blind” climbed to #4 in Vancouver, #5 in Victoria, #8 in Calgary and #20 in Toronto. In Edmonton, the year-end Top 100 countdown, the song was listed at #86 on CHED. 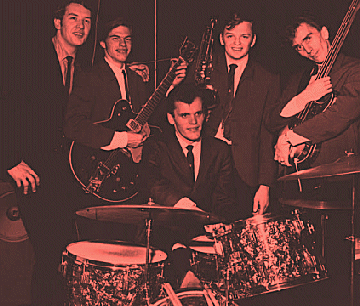 After Howie Vickers left the band in 1969 they were in the process of reforming. Before 1970 came to a close they named themselves Chilliwack, a Salish Native Canadian name meaning “valley of many streams.” It is also the name of a city in the Fraser Valley, east of Vancouver. Chilliwack had their first Top Ten hit in Vancouver with “Lonesome Mary” in 1971. According to Skelly, Chilliwack’s record company, A&M, “fumbled by wasting “Ridin’” as the flip side to “Lonesome Mary.” An ode to train travel, it had a jangly Byrds meets CS&N vibe. Unfortunately, “Ridin’” was the only obvious followup single. Likely, realizing the mistake, A&M supposedly flew the band down to whip off a pair of straight up rockers: “Hit Him With Another Egg” and “Rock n Roll Music. I never heard the finished but never-released product.” Skelly writes that later re-recorded versions of these songs ended up as tracks on a subsequent album, All Over You, but these were not as good as their first recordings. In January 1977 the band recorded their sixth studio album, Dreams, Dreams, Dreams. At the time the band members were all involved with Scientology and there was a dedication to the founder of the Church of Scientology, Ron L. Hubbard, on the back of the album. By 1977 the bands musicians consisted of Henderson, Turney, Miller and Howard Froese on guitar, vocals, solina and piano. The album included several successful single releases in the Canadian market that included “Fly At Night”, “California Girl” and “Baby Blue”. But it was the band’s ninth album release in 1981, Wanna Be A Star, that took them to the pinnacle of their success. The single “My Girl (Gone, Gone, Gone)”, went Top 30 on the Billboard Hot 100, #3 nationally in Canada and #1 in Vancouver.